Baby Boomers will be the next generation to be “Rockin’ in the Free World” at the Indio Polo Grounds near Palm Springs. Desert Trip – The Coachella of classic rock – is coming this October. Tickets go on sale Monday, May 9 at 10:00 a.m. Pacific Time. Since 2001, crowds of Generation Y music fans have been flocking to the Polo Grounds for the annual Coachella Festival — known for top-tier bookings and headline-grabbing reunion shows (Outkast, Guns N’ Roses). Now the Coachella Festival Promoter, Goldenvoice, has announced its newest music festival to be held at the Polo Grounds. Desert Trip, scheduled for October 7 through 9, will feature a power house line up of classic rock legends including Bob Dylan, the Rolling Stones and Paul McCartney. Rounding out the bill will be rock and roll icons Neil Young, the Who and Roger Waters of Pink Floyd. But instead of a drawing a millennial-heavy crowd, this festival aims squarely at Baby Boomers, many of whom attended the original Woodstock on Yasgur’s Farm back in the summer of 1969. You can find great places to stay during The Festival – you just have to know where to look. If you are traveling with a group of four to ten people, you’ll want to consider staying in a luxury vacation home rental in the Coachella Valley. Here are some of our best picks. PARADISE VILLA – LA QUINTA – 5 Bedroom / 3.5 Baths / Sleeps 10. Walk to Old Town. 10 minutes from Festival Grounds. Very private pool yard, spa. Priced from $280 per person/per night. Available as a Vacation Home Rental through Acme House Company. Stay near Coachella. MIDCENTURY ROSE – PALM DESERT – 4 Bedroom / 4 Baths / Sleeps 8. 13 miles from Festival Grounds. Private pool yard, spa. Priced from $118 per person/per night. Available as a Vacation Home Rental through Acme House Company. Stay near Coachella. NESTLED IN THE COVE – RANCHO MIRAGE: 3 Bedroom / 2 bath / Sleeps 6. 14 miles from Festival Grounds. Priced from $122 per person / per night. Available as a Vacation Home Rental through Acme House Company. Stay near Coachella. VILLA MIRAGE – RANCHO MIRAGE – 3 Bedroom / 3 Baths / Sleeps 6. 15 miles from Festival Grounds. Very private pool yard, spa. Priced from $129 per person/per night. Available as a Vacation Home Rental through Acme House Company. Stay near Coachella. DESERT VIEW PARADISE – PALM SPRINGS – 4 Bedroom / 4 Bath / Sleeps 10. 26 miles from Festival Grounds. Gorgeous mountain views, walled for privacy, heated inground pool. Sale Priced from $78 per person / per night. Available as a Vacation Home Rental through Acme House Company. Stay near Coachella. MAD MEN IN THE DESERT – PALM SPRINGS: 4 Bedroom / 3 Bath / Sleeps 8. 27 miles from Festival Grounds. Priced from $102 per person / per night. Available as a Vacation Home Rental through Acme House Company. Stay near Coachella. SAN LUCAS HIDEOUT – PALM SPRINGS: 3 Bedroom / 2 bath / Sleeps 6. 24 miles from the Festival Grounds. Priced from $115 per person / per night. Available as a Vacation Home Rental through Acme House Company. Stay near Coachella. 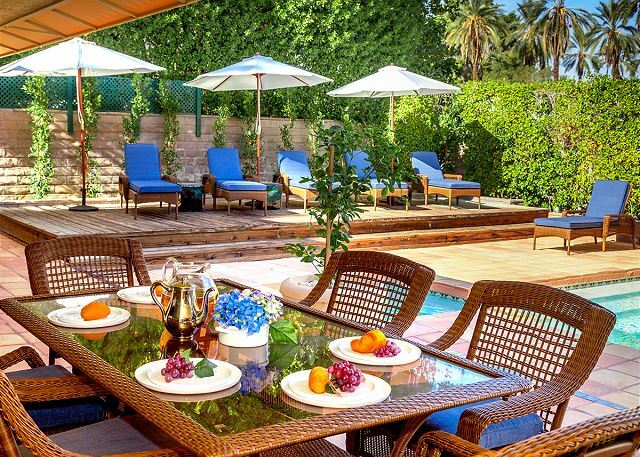 ABOUT ACME HOUSE COMPANY: Acme manages Luxury Vacation Rental Homes in Greater Palm Springs and the surrounding desert cities, catering to those looking to travel to the world-renowned destination for the season, week-long stays and extended weekends. Check us out if you want to stay near Coachella. Visit Acme’s Website to explore more Palm Springs Vacation Rental Homes.